German winters tend to be grey and depressing, but once the sun comes out and the weather warms up, the Germans really know how to live it up with outdoor activities, from festivals to Biergartens. Last night, I participated in one these outdoor activities as I dined on sausages and beer while traveling on a boat up the Neckar River. A friend and coworker had organized the event with the Stuttgart Partyfloss for about 20 of us. We met at the Wilhelma U-bahn stop, and from there walked down to the pier to board the boat. For 29,90€ we enjoyed unlimited sausages and beer (quite a deal!) as we took in the river scenery. The food was served buffet-style and included fresh-grilled sausages. Most bars and restaurants tend to be serviced by one brewery. 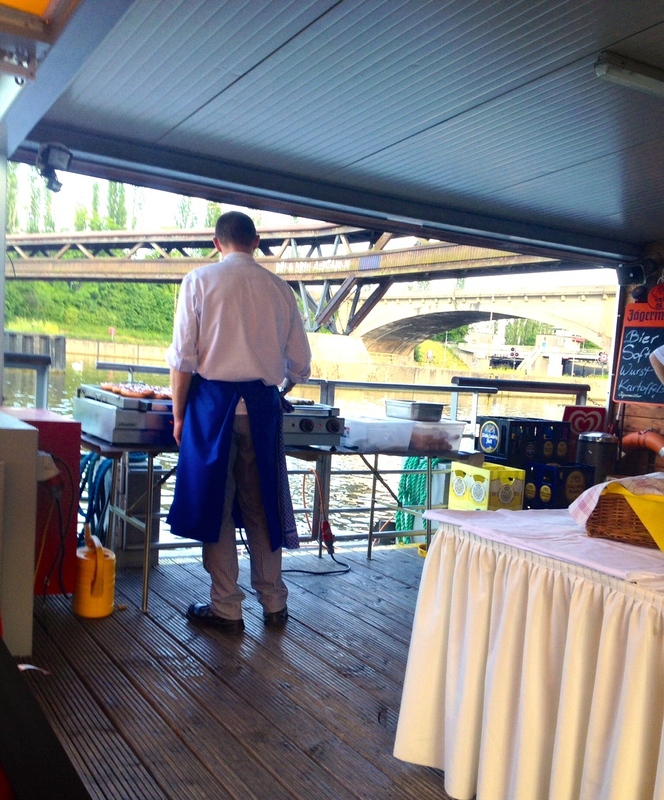 The beer on the boat was provided by König Ludwig Brauerei. You could choose from the Dunkel (dark), Weissbier Dunkel (dark wheat beer), Weissbier Hell (light wheat beer), Weissbier Kristall (crystal wheat beer), and Hell (light). I personally stuck to the Weissbier Hell, since it's one of my favorite kinds of beer. I should note that wheat beers tend to be a bit heavy, especially when drinking them with a meal, but I just haven't gotten used to drinking pils (unless I'm at the Wasen--Stuttgart's version of Oktoberfest) since the flavor is a bit too watery for me. I did try Matt's Weissbier Dunkel and found it to be rather tasty as well. I'm pretty sure they had an alcohol free beer as well, though I didn't try it. Soft drinks and water were also available for free, and wine and Jägermeister shots were available for purchase. The food was basic German grill food. There were two kinds of Wurst (sausages) that looked to be Rote Wurst and Fränkische Bratwurst. Rote Wurst is common in this region (known as Schwabia), and I love it for the rich pork flavor. It's so much better than what we consider to be "hot dogs" back home. I'm guessing the second sausage we ate was a Fränkische Bratwurst. The flavor reminded me a lot of the tiny Nürnberger sausages that I've bought from the grocery store. They were similar in color (light pork filing) and taste (I think marjoram was used), except the Fränkische Bratwurst was a bit bigger. I've never had that kind before (which is pretty easy to say given the vast number of sausages found in Germany), but the name seems to be right according to Wikipedia. 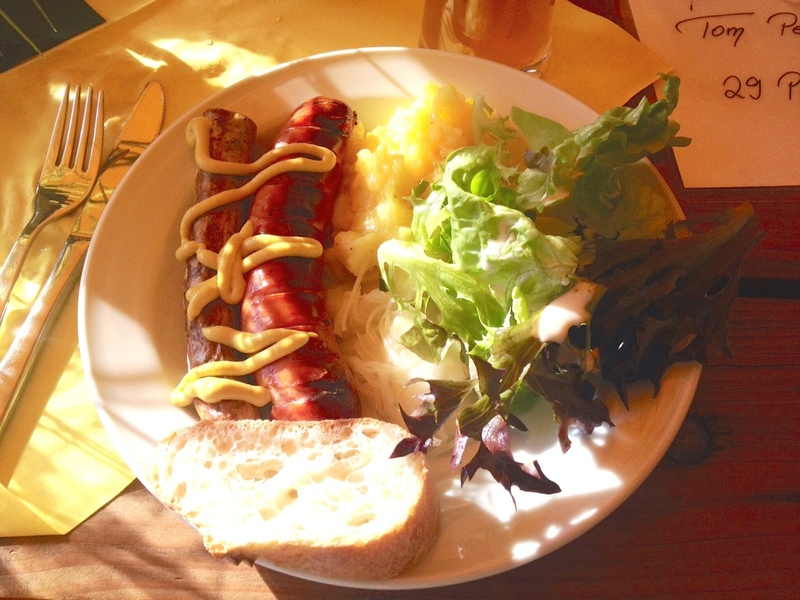 The sausages were grilled right on the boat and served with baguette slices, traditional German potato salad (which is vinegar-based, contrary to American potato salad), sauerkraut ("sour" cabbage), salad with yogurt dressing, and ketchup and mustard. The food was simple, but delicious and satisfying. The cruise lasted about 2 hours, during which time we passed by the beautiful green fields and vineyards that surround Stuttgart. Stuttgart is known for the amount of green both in and outside of the city, and I remember being amazed to see vineyards growing along the sides of the valley right next to the city when we moved here. 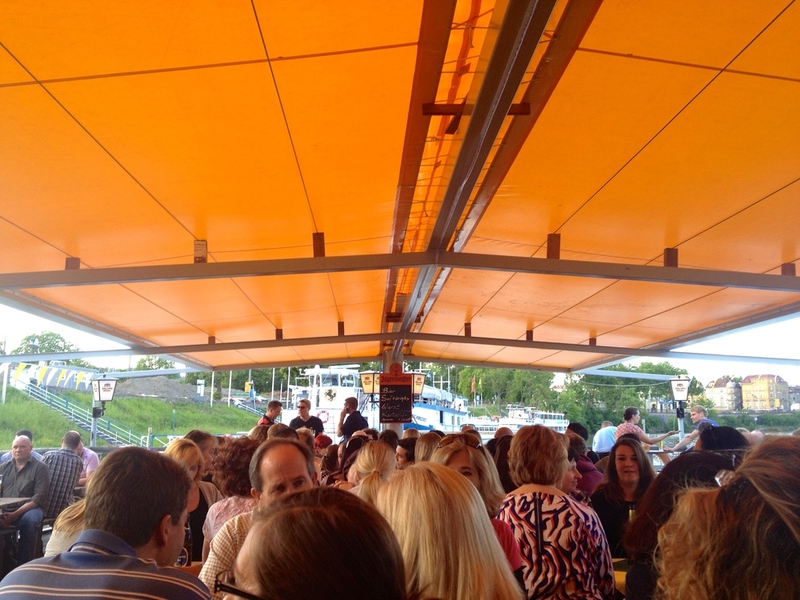 Since the river cruise ended around 8:00 pm, our group moved on to the Stadtstrand on the other side of the river to continue socializing. I'd heard of this bar, but never gotten a chance to visit. The big selling point is that the bar is surrounded by a man-made beach. You can enjoy your drinks while relaxing in a beach chair with your toes in the sand. The bar stocks all the basics, including beer, wine, and a few cocktails. My wine was predictably table-quality (i.e. not good, but drinkable if you're already a bit tipsy), though the Aperol Spritz I tried wasn't bad. I've heard they have food as well, though I didn't try any on this outing. All-in-all I had a fabulous time drinking and catching up with friends in the gorgeous weather. It seems summer is quickly approaching, and I'm looking forward to making the most of it!